TED DANSON: Imagine a shape. Imagine a color. Imagine virtually any form that life might assume, and you'll find it in the ocean. The sea is home to living diversity that transcends imagination, diversity that has inspired our creativity and intellect since we first became human. In 1853, master glass artisan Leopold Blaschka was sailing from Europe to the United States. The wind died off the Azores, leaving the ship becalmed for two weeks. Jellyfish and other creatures moving past the rail entranced Leopold. He drew them, determined to later capture the shining essence of the creatures in glass. 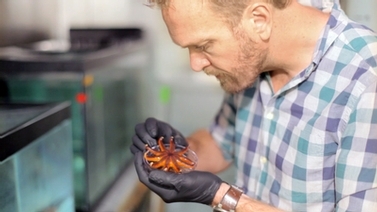 Marine biologist Drew Harvell curates a collection of Blaschka glass masterpieces at Cornell University, where she's a professor in the Department of Ecology and Evolutionary Biology. DREW HARVELL: I have spent my life studying these details of invertebrate form and function, and it continues to amaze me some of the details that I learn from looking at the models. TED DANSON: The Blaschka models were crafted not just for aesthetics, but to accurately represent individual species. Each color and shape, from red tentacle to blue eye spot, represents underlying biology. Every living form has function, many essential to the survival of the species, and each species has a role in maintaining a healthy ocean. DREW HARVELL: Biodiversity in our marine ecosystems provides proper functioning of those ecosystems, and also insurance against environmental change. TED DANSON: Leopold Blaschka would have had difficulty imagining the changes to come to the ocean over the next century and a half. We have exponentially expanded human population, knowledge, and capabilities. 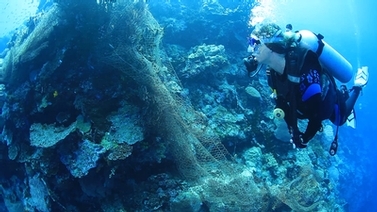 But in the process, we've put the living diversity of the ocean at risk. The Blaschka models provide a time capsule to measure the ocean of today against that of Leopold's time. As complex and delicate as the glass models are, the living things they represent and the ecosystems these organisms are part of are infinitely more so. Now, scientists, artists, policymakers-- everyone has a brief window of opportunity to take the knowledge and tools that we've acquired since Blaschka's time and apply our collective imagination to protecting this priceless, fragile legacy. In the midst of extinctions and stress triggered by pollution, over-fishing and habitat loss, the web of marine biodiversity is increasingly fragile. This film combines science, art, history and conservation, following a global quest to find living representatives of the bizarre and beautiful sea creatures captured in glass over 150 years ago by renowned artists Leopold and Rudolf Blaschka -- 570 sculptures of jellyfish, octopus, squid, anemones and nudibranchs now housed in the Cornell Collection of Blaschka Invertebrate Models. Narrated by Ted Danson and featuring Cornell marine biologist Dr. Drew Harvell, Fragile Legacy is produced by David O. Brown with support by the Atkinson Center for a Sustainable Future and the Corning Museum of Glass Foundation.